Lets start at the very top of the window with its title bar. At the left of the title is a proxy icon representing the current directory for the current Bash command shell, and beside it the name of that folder. (Note that directory is the Unix/Linux/DOS word for what OS X and Windows refers to as a folder.) 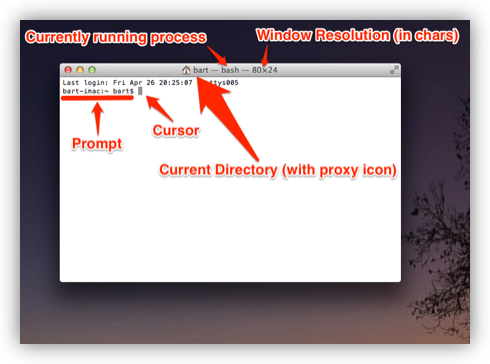 Like Finder windows, Terminal sessions are always “in” a particular directory/folder. After the current directory will be a dash, followed by the name of the process currently running in the Terminal session (in our case, a bash shell). The current process is followed by another dash, and then the dimensions of the window in fixed-width characters. Within the window itself you will likely see a line of output telling you when you last logged in, and from where (if it was on this computer it will say ttys followed by some number, if it was from another computer, it will give the computer’s hostname). This will be followed on the next line by the so-called command prompt, and then the input cursor. First you have the hostname of the computer on which the command shell is running (defined in System Preferences → Sharing → Computer Name). This might seem superfluous, but it becomes exceptionally useful once you start using ssh to log in to other computers via the Terminal. The hostname is followed by a : and then the command shell’s current directory (note that ~ is short-hand for “the current user’s home folder”, more on this next time). The current directory is followed by a space, and then the Unix username of the user running the command shell (defined when you created your OS X account, defaults to your first name if available). Finally, there is a $ character (which changes to a # when you run bash as the root user). Again, this might not seem very useful at first, but there are many reason you may want to switch your command shell to run as a different user from time to time, so it is also very useful information. Now that we understand the different parts of our Terminal window, lets have a look at the structure of the actual commands we will be typing at that cursor! I want to start by stressing that the commands executed by a command shell are not determined by the command shell, but by the operating system. 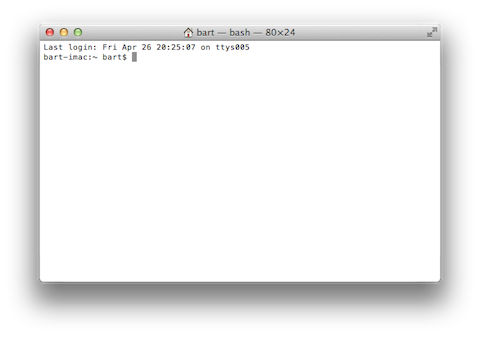 Regardless of whether you use Bash on OS X, or zsh on OS X, you will have to enter OS X commands. Similarly, if you use Bash on Linux, you will have to enter Linux commands. Thankfully Linux and Unix agree almost entirely on the structure of their basic commands, so with a very few (and very annoying) exceptions, you can use the same basic commands on any Linux or Unix distribution (remember that at its heart OS X is Free BSD Unix). Arguments are a mechanism for passing information to a command. Most commands need at least one argument to be able to perform their task, but some don’t. Both commands and arguments are case-sensitive, so beware your capitalisation! In this example, the command is cd, and the one argument passed is /Users/Shared/. It is up to each command to determine how it will process the arguments it is given. When the developer was creating the command he or she will have had to make decisions about what arguments are compulsory, what arguments are optional, and how to parse the list of arguments the command is given by the shell when being executed. In theory every developer could come up with their own mad complex scheme for parsing argument lists, but in reality most developers loath re-inventing the wheel (thank goodness), so a small number of standard libraries have come into use for parsing arguments. This means that many apps use very similar argument styles. As well as accepting simple arguments like the cd command above, many apps accept specially formatted arguments referred to as flags. Flags are usually used to specify optional extra information, with information that is required taken as simple arguments. Flags are arguments (or pairs of arguments) that start with the - symbol. The simplest kinds of flags are those that don’t take a value, they are specified using a single argument consisting of a - sign followed by a single letter. For example, the ls (list directory) command can accept the flag -l (long form listing) as an argument. e.g. These single-letter flags works great for simple commands that don’t have too many options, but more complex commands often support many tens of optional flags. For that reason another commonly used argument processing library came into use that accepts long-form flags that start with a -- instead of a single -. As well as allowing a command to support more flags, these longer form flags also allow values to be set within a single argument by using the = sign. So far we know that commands consist of a command optionally followed by a list of arguments separated by spaces, and that many Unix/Linux commands use similar schemes for processing arguments where arguments starting with - or -- are treated in a special way, and referred to as flags. That all seems very simple, but, there is one important complication that we have to address before finishing up for this segment, and that’s special characters. Within Bash (and indeed every other command shell), there are some characters that have a special meaning, so they cannot be used in commands or arguments without signifying to the command shell in some way that is should interpret these symbols as literal symbols, and not as representations of some sort of special value or function. The most obvious example from what we have learned today is the space character, it is used as the separator between commands and the argument list that follows, and within that argument list as the separator between individual arguments. What if we want to pass some text that contains a space to a command as an argument? This happens a lot because spaces are valid characters within file and folder names on Unix and Linux, and file and folder names are often passed as arguments. You have two choices for how you deal with these special characters when you need to include them within an argument, you can escape each individual special character within the argument, or you can quote the entire argument. Escaping is easy, you simply pre-fix the special character in question with a \. If there are only one or two special characters in an argument this is the simplest and easiest solution. But, it can become tedious if there are many such special characters. bart-imac:~ bart$ echo Hello\ World\! If you don’t want to escape each special character in an argument, you can quote the argument by prepending and appending either a " or a ' symbol to it. There is a subtle difference between using ' or ". When you quote with " on the other hand you are doing so-called partial quoting, which means you can use most special characters without escaping them, but not all. Partial quoting will become very important later when we start to use variables and things, because the biggest difference between full and partial quoting is that you can’t use variable substitution with full quoting, but you can with partial quoting (don’t worry if that makes no sense at the moment, it will later in the series). bart-imac:~ bart$ echo "# ;\! ()&<>|"
bart-imac:~ bart$ echo "\\ \$ \" \`"
There are a few other peculiar edge cases with partial quoting – for example, you can’t end a partial quote with a !, and you can’t quote just a * on its own (there may well be more edge cases I haven’t bumped into yet). That’s where we’ll leave it for this segment. We’ve now familiarised ourselves with the OS X Terminal window, and we’ve described the anatomy of a Unix/Linux command. In the next segment we’ll look at the Unix/Linux file system, and at some of the commands used to navigate around it. Thank you Bart for this tutorial that I follow along here while you and Allison at Podfeet talk me through this. I have always had an interest in the terminal and I really hope to get a good solid foundation of the basics of Unix and how to use both the GUI and the Terminal to be as productive as I can. Thank for all of the great stuff you do. Under Terminal>Preferences>Profiles you can simply double click any of the bundled defaults, displayed in the left side bar, to get a live preview. Keep the series going, n n n. I only started listening but am really enjoying. I have some background and experience with the terminal but I love all the small nooks and crannies that you are filling in.